While it is true that any car with a working engine and four properly attached tires can safely (hopefully) take you from Point A to Point B, there’s just something really, really nice about being able to get from Point A to Point B in style and class. After all, it feels good to turn other people’s heads when you’re rolling around the city. That’s why Miami Art Cars offers our exotic car rental service in the greater Miami area so that you get the luxury, style, and class that you deserve while you cruise around. Over time, rental car companies have offered more and more sports car rental options to meet the needs of people who actually care about their driving experience. In today’s post, our high-end car rental company is going to highlight some of the best classic car rentals over the years, including our signature Mustang rental service. We’re not saying that you have to rent a Ford Mustang to look cool, but it is an affordable way to cruise around in style, comfort, and speed. 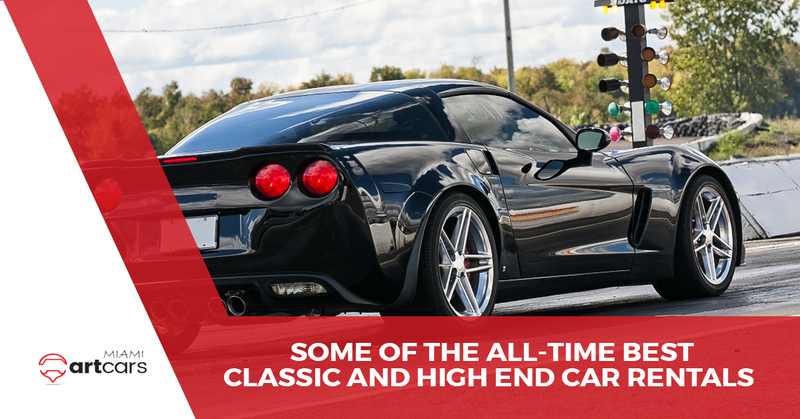 What could be known as the ‘Mustang of Chevrolet’, the Corvette is also an all-time classic that’s put smiles on millions, if not billions of faces over time. The fact that you can simply get your license scanned, pay money and suddenly be behind the wheel of a powerful V8 is pretty awesome. Renting a Corvette is a great way to experience all of the benefits of owning a muscle car without actually owning one. Sounds like a win! Like a Ford Mustang Rental! In more ways than one, the Mustang and the Corolla are of course very different machines that both achieve the same core purpose of simply getting you from one place to another. While the Corolla is efficient and reliable, the Mustang is fun to drive, good looking, and holds down a certain ‘coolness factor’ that you’ll just never get with a Corolla (we know, that’s really hard to believe). We know that you’re probably itching to get your hands on the steering wheel of a shiny new Mustang, so what are you waiting for? Get the style, comfort, and speed you deserve at the wheel by pulling the trigger on a brand new Mustang rental today through Miami Art Cars. Contact us today for more information and rental specifics!